When I cooked lau at home for the first time ever. I am sorry if you came here expecting some sordid tales of childhood trauma as I don't have any for you in this post. 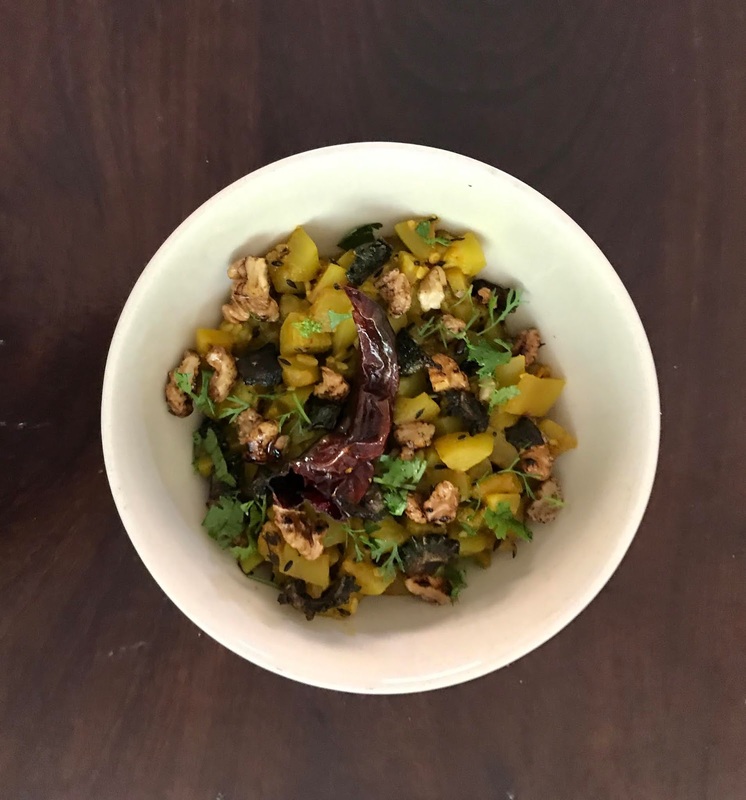 This post is actually about two vegetables, which are a fixture in every Bengali kitchen, and which I hated from the bottom of the heart since my childhood and I know that I am not alone in that. For the record, I was never forced to eat them as a kid. I am talking of two Indian summer vegetables. Lau in Bengali AKA lauki in Hindi AKA doodhi in Gujarati AKA bottle gourd in English. The other is korola in Bengali AKA karela in Hindi and bitter gourd in English. Let's take lau first. I found the squishy and slithery texture of dishes made with it in our house to be the most grotesque thing imaginable as a kid and just refused to touch them. Years later, the tables were turned on me when I used to subscribe to a dabba (lunch) made by a lady in Mumbai, while working in a market research agency here. She would send the most gruesome lauki curry once a week and that, with the thick lifeless rotis that would come with it, would be my version of Dante's Hell. Then there is the karela. This was often served sliced and fried, or in the water shukto (a vegetable stew), at my granny's house and at ours too. The grown ups liked it. So did my younger brother! I steadfastly refused to give in to its bitter overtures. It is only after I left home that I began to appreciate the shukto as served in the local Bengali restaurants in Mumbai with the odd bit of karela thrown in. These shuktos were way creamier than what was served at home and had a touch of sweetness in them too which played hide and seek with the muted bitter flavours of the karela. Now, as you probably know, I am on a mission to eat food that is healthier, and yet is tasty and does not make me sad. I call these my #LittleJackHornerMeals, after the Nursery Rhyme character of the same name who once asked, "what a good boy am I?" Part of this initiative is having a much higher proportion of vegetables that ever before in my diet as I have been asked to go easy on meats and carbs for a bit. That is when I got the idea of giving lauki and karela a shot. These are in season now, though you do get them in Mumbai all year. Eat seasonal and eat local are the buzzwords in the food media after all and it was time to practise these values which our grannies always believed in. 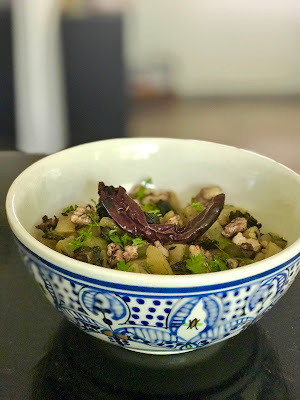 I had recently cooked lau for the first time when I made lau chingri, a Bengali classic dish which combines lau and tiny prawns, at my granny's house in Kolkata for a client project. I decided to use the same lau recipe again, but this time without prawns. The challenge was to overcome the mushy texture that lauki often gets. To solve this, I decided to cook the lauki in a wok and to give in some textural contrast, as we have been taught to do by the judges in master Chef Australia, by adding toasted walnuts. I added just a few drops of honey to the walnuts to give the odd burst of sweetness. To give a counterpoint to this, I added a few tiny bits of karela, which I had crisped up in a bit of oil with crushed black pepper and lime juice. The idea was to break the flatness of the taste profile of the lauki. I was quite happy with the end result. I had had it for lunch with rotis freshly made by our cook Banu, who sliced the lauki for me too, and then for dinner with red rice. I guess this would answer those on Instagram who DM'd me asking why I added karela and the unheard of walnuts to lau. I guess there is merit to using your grandmother's recipes and then building on her legacy to adopt it to your tastes. I know that didu, my granny, would approve of this. As a young bride in Delhi, who was far away from her birthplace of Dhaka, she did pick up recipes from her neighbours who belonged to all over India and make them her own. She has never been one to be bound by conventions and traditions after all. Heat 1.5 teaspoon of any vegetable oil. We alternate between canola and rice bran oil these days. Once this begins to smoke and sputter, add in the peeled and finely cubed lauki. Keep stirring in the wok or korai or kadhai, till the lauki cooks and yet remains firm. 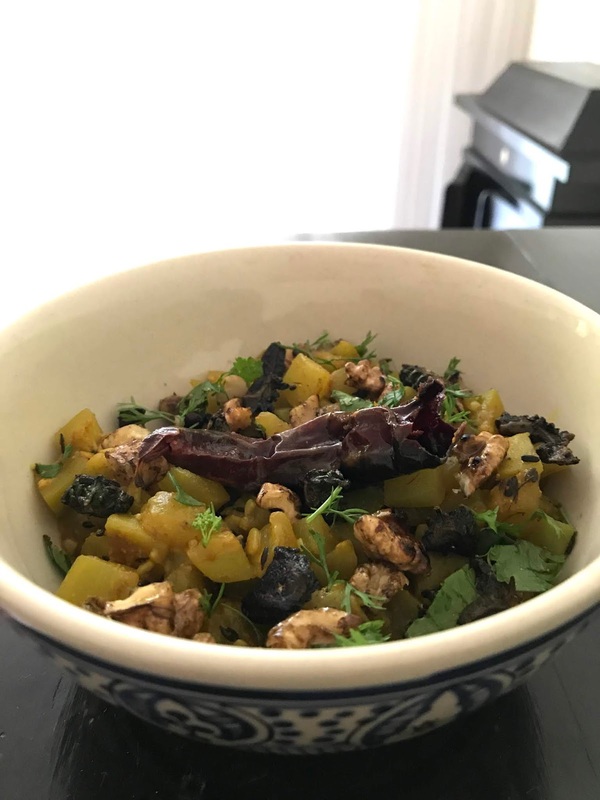 Once cooked, add the karela and the walnuts, mix them in and turn off the flame and add some freshly chopped coriander on the top. PS: There was a time when coriander leaves in Kolkata were as prized and as novel as micro-greens are today. My grandmom tells me that you still do not get coriander leaves as abundantly in Kolkata as we do in Mumbai. I guess that's why Kolkata doesn't have much of a green chutney culture. PPS: Never for a moment underestimate the ingenuity of a Bengali granny. Don't forget that one of the most classic vegetarian ways of making lau in Bengal is by adding roasted moong dal to the lau. This not only adds in texture, but gives a protein burst too. I stressed on the 'vegetarian' bit, given that the most celebrated ways to cook lau are with prawns or with a fish head for the machhed mudo diye lau. Link to the video of me cooking lau chingri with didu. Why 'shaadher lau'? Click on this. My dad would often sing this to me when he wanted to tease me!